Condition is Used. If you lookingfor a DJ M6 00 don’t looseo ut o n th e mo st p am pe re d on e ou t there. Behringer DDM4000 DIGITAL DJ Mixer with Dual Effects, Good condition. 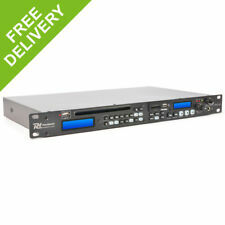 A 19" user friendly digital, compact, 1U high media player / recorder with dual USB ports and an SD and CD slot. Designed for many applications where a.o. a stable sound is required. The recording function and other functions such as Cue and Pitch, " 10" and Program, Single Repeat and Folder, etc, makes the media player to a perfect unit for use in discos, bars, cafes, clubs, at home etc..
Vocal-Star VS-250A Karaoke Amplifier 400w with Bluetooth and 4 microphone Inputs. Pro Karaoke Amplifier - simply connect to Passive Speakers. • 2 Channel amplifier with two outputs which allow you to connect various passive DJ speakers to achieve the sound you are after. Numark Dual CDN225 Pro CD Player and Head Unit With Numark C1 3 Channel Mixer In Well Made Cabinet All Fits Nicely. May need looking at. MIDI Mixer fader and eq 2 channels: 3 bands. Emulating a traditional console appearance in Party Mix DJ could not miss a crossfader to close the mixer section. -3 RGB LEDS for light effects. They are compact, durable and built to an excellent standard. 6 Channel Professional DJ Mixer – USB/SD Player. Channel AUX output level –per channel. Channel Peak LED –per channel. 2x Stereo channel line input – 6.35mm jack. 1 X 6 Channel DJ Mic Mixer. Headphone: 7V/220Ω. Total Harmonic Distortion:≤0.03%(At 1KHZ). Power Consumption : 30W. Built-in digital reverberation effect processor. Common Mode Rejection:-70dB. Channel MIC/LINE: 6 CH. UltraMixer 5 Pro entertain. for UltraMixer 5 Pro entertain Marke UltraMixer. is the professional DJ software for Mac and Windows. Auto Sync function automatically adjusts the music or music videos and on request also takes care of the aperture (auto DJ) while you can add more titles, cue or cue points and effects. Equaliser : bass – -30 10dB @ 100Hz. Equaliser : midrange –30 10dB @ 800Hz. Equaliser : treble – -30 10dB @ 9kHz. Rack mountable – 4U (on a 19” rack). 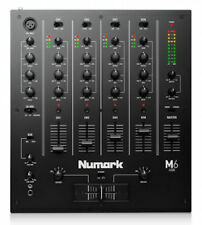 14 Input – 4 Channel Professional DJ Mixer – USB & Rack mountable. This 8-channel mixer with amplifier suits a number of different applications, like Live PA, DJ, musicians, bands and other PA purposes. Each input channel has separate bass and treble control as well as an individual level control per channel. The built-in echo effect generator has adjustable time and repeat options and the level can be set for each channel individually. The unit is built in a strong and sturdy case that will protect the mixer both on-stage and during transport. The Behringer X18 gives you a whole new way to mix. Flight Cases. Electrical & Power. Vacuum Parts. Depth (mm) 340. Power Tools. NEW 5m NEUTRIK 2.5mm 2 Core PA Speaker System Lead SPK Speakon Cable NL4FX 380cossy(755). Dedicated gain and filter knobs for each channel. No Limits on Your Creativity. Product Code: SSD0618. Mix With 4 Decks. Smoke Machines. Can I reserve item(s) that I intend to buy later?. What is the warranty period on Electromarket products?. They are compact, durable and built to an excellent standard. 10 Channel Professional DJ Mixer – USB/SD Player. Channel AUX output level –per channel. Channel Peak LED –per channel. 2x Stereo channel line input – 6.35mm jack. What if I have not received my order?. Video will open in a new window. In Ear Monitoring. Accessories for Trussing. When will I receive confirmation of my order?. Power Supplies. How do I find the item number or product code?. Keith McMillen K-BOARD. Sustain button. Pad pitch bend. Tipo Keyboard. Power: USB bus power. Toggle on/off button. ITALIAN SECURITY THROUGH RECEIPT OR INVOICE VALID 2 YEARS. 25 velocity sensitive keys with LED lighting, pressure and inclination. LED Tape Light. Squire Sound & Light has decades of experience in the professional audio market. Integrated Class Compliant Plug-and-Play USB Audio for Mac & PC. Squire Sound & Light UNIT 34 QUEENS COURT.